LEBANON, Tenn., Oct. 30, 2017 /PRNewswire/ -- Cracker Barrel Old Country Store® will honor our nation's heroes this Veterans Day by offering military veterans a complimentary slice of its Double Chocolate Fudge Coca-Cola® Cake. Guests of Cracker Barrel are also invited to help America's military families by participating in a giving campaign in support of Operation Homefront, a national nonprofit focused on building strong, stable and secure military families. 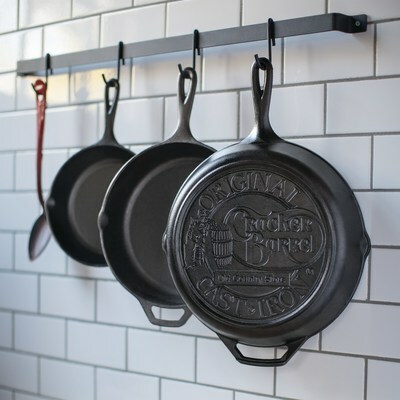 Between Oct. 30 – Nov. 11, Cracker Barrel will donate 20 percent of proceeds from online and in-store purchases of Lodge cookware to Operation Homefront. 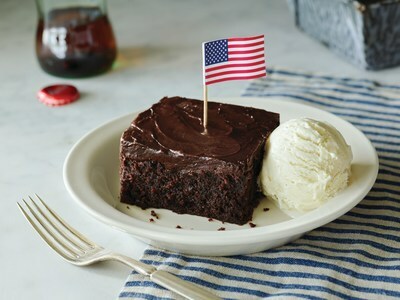 All military veterans will receive a complimentary slice of Double Chocolate Fudge Coca-Cola® Cake on Nov. 11 at all Cracker Barrel stores in honor of Veterans Day. "Supporting America's military is core to who we are and what we stand for," said Cracker Barrel Manager of Corporate Citizenship Sloane Lucas. "We are fortunate to be able to partner with organizations like Operation Homefront to express our gratitude for the sacrifices America's service members make for our country. We look forward to again welcoming the men and women who have served our nation, and we invite all of our guests to join with us in honoring them." Operation Homefront serves America's military families in numerous ways. Since its founding shortly after 9/11, the organization has fulfilled nearly 37,000 requests for emergency assistance, providing more than $21 million in financial aid to help military families overcome many of the challenges inherent to military life. "Operation Homefront is continually grateful for our partnership with Cracker Barrel and their generous support of veterans and military families," said Jill Eskin-Smith, Operation Homefront senior director of corporate and foundation partnerships. "Thank you to Cracker Barrel and their guests who enable us to fulfill our mission to build strong, stable and secure military families so that they can thrive, not simply struggle to get by, in the communities they have worked to protect." Last year, Cracker Barrel and the Cracker Barrel Old Country Store Foundation together contributed over $430,000 to Operation Homefront through monetary and in-kind donations. Most recently, Cracker Barrel donated over 1,100 of its iconic rocking chairs to Operation Homefront in support of its many programs, including "Homes on the Homefront" that helps place deserving veterans and their families in mortgage-free homes. Cracker Barrel Old Country Store, Inc. (NASDAQ: CBRL) provides a friendly home-away-from-home in its old country stores and restaurants. Guests are cared for like family while relaxing and enjoying real homestyle food and shopping that's surprisingly unique, genuinely fun and reminiscent of America's country heritage…all at a fair price. Established in 1969 in Lebanon, Tennessee, Cracker Barrel Old Country Store, Inc. and its affiliates operate 646 Cracker Barrel Old Country Store® company-owned locations in 44 states and own the fast casual restaurants Holler & Dash®. Nation's Restaurant News' 2016 Consumer Picks survey named Cracker Barrel Old Country Store® the Best Family-Dining Restaurant in America. For more information about the company, visit crackerbarrel.com.